Instagram released videos back in 2013. They wanted their videos to be as easy to make and share as possible. Although the Instagram video length limit was just 15 seconds at the time, it quickly became a sensation among users. Today, Instagram videos formats are very different and the requirements are more advanced than before. As a result, there are some required Instagram video resolutions that need to be met before posting. Below you’ll find all the full Instagram video specs that apply today. Grab our cheat sheet and start creating! Minimum Instagram landscape video dimensions are 600 x 315. Instagram landscape aspect ratio is 1:91:1. Max Instagram file size is 4GB. Recommended Instagram video formats are .MP4 and .MOV. Instagram video length limit 60 seconds. Instagram caption max length: 2,200 characters. Minimum Instagram square video dimensions are 600 x 600. Instagram square aspect ratio is 1:1. Minimum Instagram vertical video dimensions are 600 x 750. Instagram vertical aspect ratio is 4:5. Recommended Instagram video formats are .MP4 and. MOV. Instagram video minimum length: No minimum. Minimum Instagram Stories video dimensions are 600 x 1067. Recommended Instagram Stories video dimensions are 1080 x 1920. Instagram Stories aspect ratio is 9:16. Recommended Instagram Stories video formats are .MP4 and .MOV. Instagram Stories video length limit is 15 seconds. Minimum Instagram carousel video ads resolutions are 600 x 600. Maximum Instagram carousel video ads resolutions are 1080 x 1080. Instagram carousel video ads aspect ratio is 1:1. Recommended caption length: 125 characters. Wouldn’t you like to know how your the best Instagram videos perform? Now you can track the performance of your Instagram videos with Sotrender. 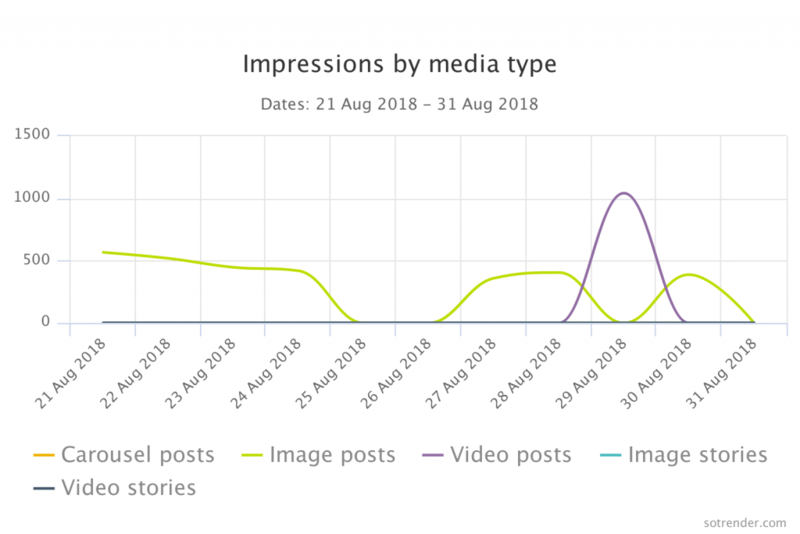 We’ve just released the revamped Instagram Analytics for Business, so now you can connect your Instagram business profile, streamline analyses and get insights that’ll help you see the bigger picture behind your profile and improve your engagement. Let me show you the best way to analyze the performance of your best videos. 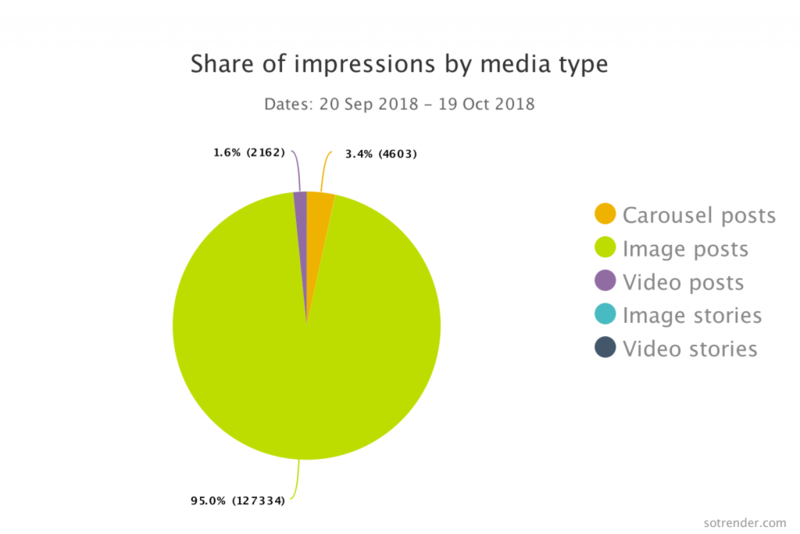 Evaluate also the total share of impressions by media type. The chart below shows you what media type attracts the most attention. This way you learn what your audience enjoys most and it clearly indicates what media types you should be sharing in the future to hit the higher engagement. 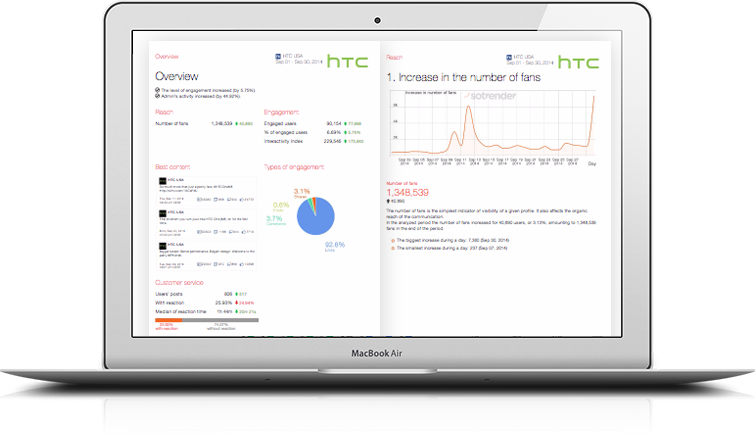 You can analyze also share of impressions day by day in a selected time period. 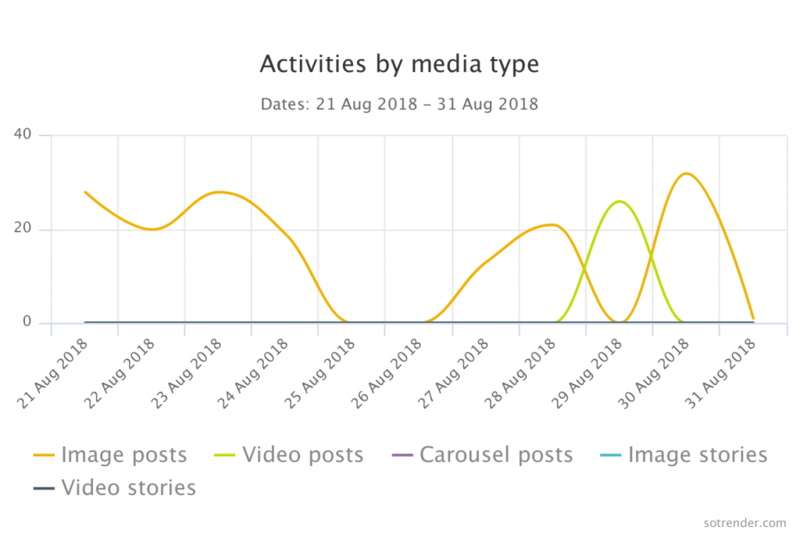 Remember to monitor the number of activities gathered under video posts in comparison to image posts to understand what is engaging your audience better. Last but not least, analyze whether publishing video content had an impact on the number of followers or engagement rates. Bitrate: No limit to bitrate file if you’re using two-pass encoding, as long as your file doesn’t exceed 1 GB. Otherwise, 8 megabits per second for 1080p and 4 megabits per second for 720p. Thumbnail image ratio: Should match the aspect ratio of your video. Meeting all the requirements from this post shouldn’t be a problem for most modern iOS and Android mobile devices. If you have an older or more obscure smartphone, consider changing to a newer model to take advantage of Instagram videos. Now you have all you need for the job. But for the full story, let me just give you a little bit of background information about Instagram videos and their requirements. Over 5 million people viewed brand-created Instagram videos in Q1 2017. Instagram is seeing a big-time rise in ad dollars coming to the platform lately. It seems brands have found greener pastures on Instagram over Facebook’s News Feed. This calls for changes in the way marketers capture leads. Instagram video campaigns are no longer a nice-to-have strategy; now it’s your necessary survival gear! Most popular video creators on Instagram as of January 2018, by user engagement (in million interactions). What’s more, experts say ‘Stories’ was Instagram’s smartest move yet. ‘Stories’ were released in August 2016 as a directly copied feature from Instagram’s competitor, Snapchat. Now it hits 400 million users daily. That’s over twice the number of users Snapchat had for its entire app life! Today, brands can use Stories to promote their products too! The platform lets you seamlessly integrate your video ads between organic releases so that they blend in. If you’re not using the power of video to meet your marketing goals yet, it’s time to start. Pick up a camera and start churning out video content like there’s no tomorrow! How do I post videos on Instagram?